Julie originally wished to be linked with a variety of activities so that she would have more opportunities to be active in the community. Julie’s physical disability posed a challenge to being able to have regular involvement in anything other than medical appointments. Living in the communities they serve often means that Linkers are ideally-placed to help those communities identify barriers to access and inclusion, and facilitate capacity building in those areas. In Maitland, for instance, a Linker who was on maternity leave had trouble accessing the local bowling club with a pram. That is how a conversation started between the Maitland Ability Links team and the Maitland Park Bowling Club and Sporting Complex. Overcoming Setbacks - Another great story about how our Linkers can help people to overcome challenges. Natasha is a 35-year-old woman who has long struggled with her mental health. Due to her anxiety and depression, she found herself becoming increasingly socially isolated over time. Mary meets the NSW Premier! Griffith poet Mary Catanzariti has been able to achieve one of her lifelong goals with the assistance of Intereach Ability Links. Mary Catanzariti, who launched her first book ‘Mary’s Voice in Poetry’ in September, met with NSW Premier Gladys Berejiklian on Thursday 30 November and presented her with a copy of her work. To mark Social Inclusion Week, Ability Links has designed coffee cups featuring quotes from people with disability which will be seen at cafes across NSW during the week. The quotes highlight how people would like to be included. When Jacinta came to Ability Links she had lost her confidence. She was being bullied at work because of her disability. Jacinta and her Linker discussed options for looking for a new job and a workplace that better appreciated her skills. While Jacinta was still very reluctant at first, her Linker reassured her that not all workplaces are the same. Jacinta and her Linker first set about updating her resume and talked to Sureway, a local employment and training agency, about funding a traineeship. Surway spoke with Jacinta and told her she was eligible for both and that there was a job at a local caravan park for a trainee cleaner. Jacinta was worried about applying as she had never had cleaning experience, however, her Linker reassured her that it was a traineeship and they expected they would have to train someone. Alexander’s long term goal is to help others; however, first, as he says, he needs to help himself. One of Alexander’s primary motivations is telling stories; and he does so with aplomb. When St Vincent de Paul Society NSW’s Ability Links City team made a callout for participants for an RU OK Day Event, Alexander was asked if he’d like to be interviewed on stage about his life experiences with mental illness. He jumped at the chance. Alexander was nervous the entire day before the event, but he described the nervous energy as electric rather than terrifying. After, Alexander gushed about how it made him feel like he was truly contributing to helping others in some small capacity, and he found the experience therapeutic for himself as well. Since working with Ability Links, Alexander has started sharing his beach photography, and, through his new love of baking, has revitalized his friendship with his neighbour by sharing his freshly baked cupcakes. These changes may seem incremental on the surface; however, coupled with his newfound desire to be a mental health advocate and share his story far and wide they’ve had a profound impact on Alexander’s sense of community, and his sense of self. 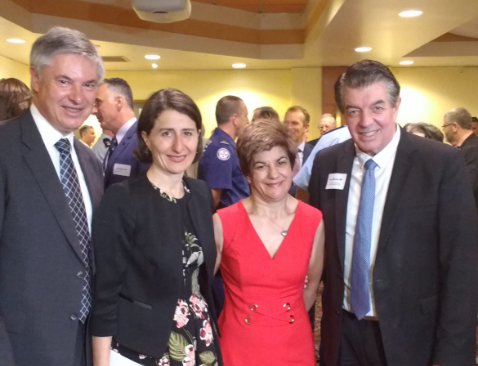 St Vincent de Paul Society NSW’s Ability Links has successfully launched ‘Creative Space’, an exciting new art program in the Southern Highlands. It’s a space where people can learn new skills and art forms, access TAFENSW training, and build friendships in an informal studio space that is inclusive and accessible. Launched last month, the program has already attracted a range of people who are producing fabulous art and ‘want to be known as Creative Makers’. A fantastic new partnership with TAFENSW has been established and there is a lot of excitement around the free ‘Pathways to Education through the Arts’ course which will start in October, run by a Koori TAFE teacher. We are also excited to be able to offer free accredited TAFENSW Creative Enterprise and Community Arts Cultural development courses which are open to the whole community from February 2018, all establishing the Creative Space as a new arts education hub in the South Western region.